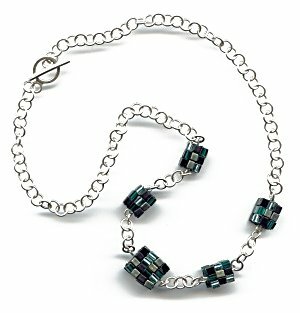 In November 2005 I was contacted by ‘Step By Step Beads' and asked if I would write up my Cubed Cubes On A Chain Necklace as a project for their magazine. I duly did and made this necklace for the step-by-step photos and it is this that appears in the July/ August 2006 issue of the magazine under the title ‘Cool Cubes'. Instructions for the pieces in this series are available in my Cubed Cubes instructions.